What are the main styles of chandeliers? Which light bulbs are used with chandeliers? What size should the chandelier be? Will my ceiling hold a chandelier? Is the chandelier fully assembled? It’s time to go up in the world. Chandeliers bring a classy and timeless look to a room. Dripping with chic, they’re the jewel in the crown of your interior-décor scheme. Fancy as a French palace or modern and minimalist, chandeliers these days can be as sophisticated or simple as you wish. Check out our webshop for modern chandeliers, designer chandeliers, rustic chandeliers, crystal chandeliers, chandeliers with shades and even ornate Florentine chandeliers. Chandeliers make a stunning design statement. They’re opulent and affluent – features that once graced the grand French palaces. But beyond the feeling of luxury and grandeur lies an often-overlooked practical benefit: with so many bulbs, chandeliers bathe the whole room in light. Give your living space its crowning glory and revel in the sheer luxury of the ultimate centrepiece design statement. Consider your room’s colour scheme and materials, then choose a style that complements those aesthetics. Be guided by our categories – from modern to Florentine and everything in between. Your chandelier needn’t be super opulent. These days, chandeliers can be small and understated, or modern and minimalist. Today, there’s a chandelier to suit every taste and every budget. Consider your room’s colour scheme and materials, then choose a style that complements those aesthetics. Be guided by our categories – from modern to Florentine and everything in between. Your chandelier needn’t be super opulent. These days, chandeliers can be small and understated, or modern and minimalist. 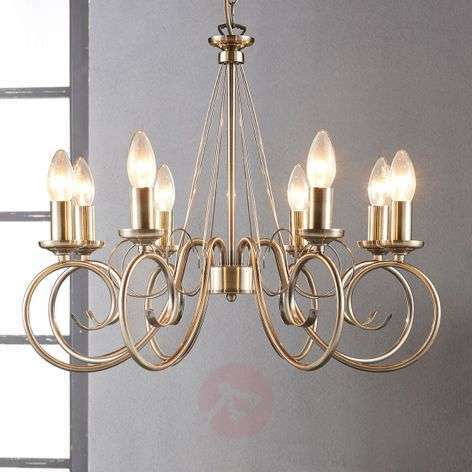 Modern chandeliers - we have modern pieces from under €100 to a few thousand. They’re bright, bold and enchanting with clean lines and sparkling jewel-like qualities. 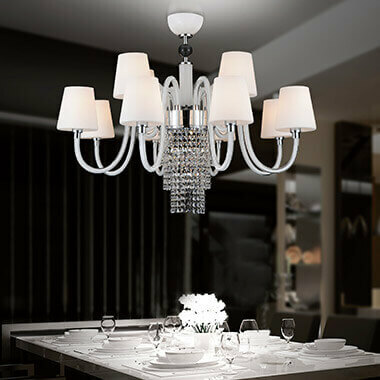 Designer chandeliers - extravagant with Swarovski crystal or sculpted in simple silver, these chandeliers make an elegant statement. 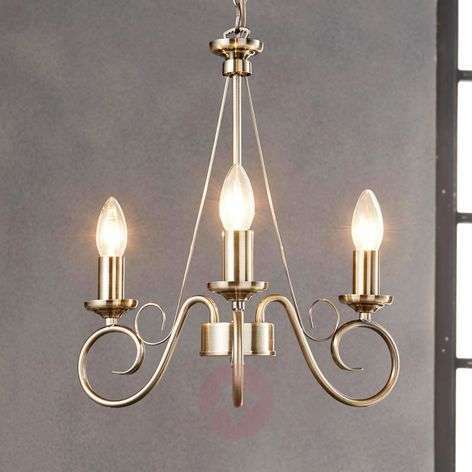 Country/rustic chandeliers - elegance comes in many forms. Carved in wood and wrought-iron, in informal colours, these fittings come with nature-inspired accents to create their own distinctive style. Classic/antique chandeliers - bursting with period detail, these chandeliers are glittering gems showcased in wrought iron, onyx and bronze. 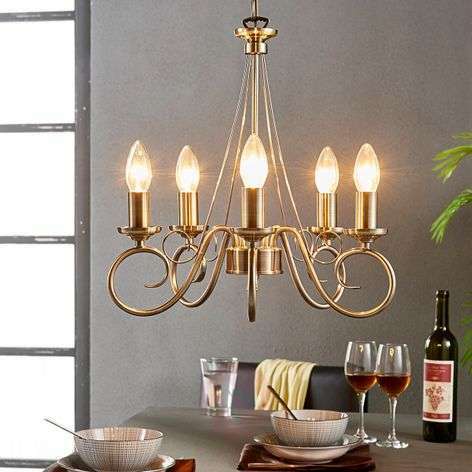 Florentine chandeliers - opulent and extravagant, these chandeliers come with elegant swags and candle bulbs just like those that burned grandly in Europe’s finest chateaux. 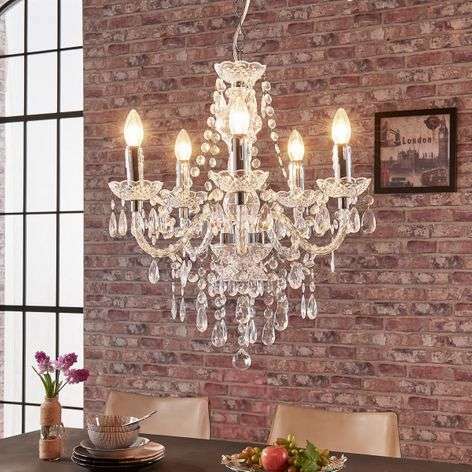 Crystal chandeliers - from Swarovski lead crystal to affordable glass crystal, we have the crystal chandelier you need to bring elegance and artistry to your living space. Chandeliers with shades - choose from handcrafted glamour, curvaceous frames and cascading crystals all capped with delicate fabric or glass shades. In selecting the bulb for a chandelier, you face a similar decision as when selecting one for any other light. Of course, the times when you would use real wax candles on the crown of a chandelier are long past. In times gone by, these shone a rather insufficient light and have of course, been readily replaced by everyone with modern lighting solutions. The most popular bulbs are E14 candle-type bulbs. These are characterised by a bulb which visually mimics the shape of a burning candle.You can use LED light bulbs, too, for energy saving and longer life. We always recommend using LED light bulbs for energy saving and longer life - they are available in the shape of a candle bulb, too. Have a look at our selection of E14 LED bulbs and you'll find great candle bulbs. In terms of the number of bulbs you have all depends on how much of a wow factor you want your chandelier to give off. However, bear in mind the brightness of the light bulbs. Note that brightness is measured in lumens: see the technical specifications on the individual product page. Dimmable light bulbs are available for your chandelier, as well as dimmable LED bulbs. The size of your chandelier depends on the height of the ceiling and the size of the room. Narrow down your choices by considering what size you need before you check out our webshop. In general, taller ceilings lend themselves to larger fixtures and lower ceilings to smaller fixtures. Filter for height, length and width in our webshop. Will your chandelier hang above a table? Make sure it’s narrower than the table so that it doesn’t overpower it. Instead, it should complement the interior. Chandeliers can be pretty heavy, so you’ll need to check the weight-bearing capacity of your ceiling. Consult a qualified electrician if you’re in doubt. Chandeliers are usually partially assembled. You may need to attach some of the decorative parts. Full instructions are provided. All of our chandeliers comply with European norm DIN-EN-60598-1. For further information, please contact Customer Services.